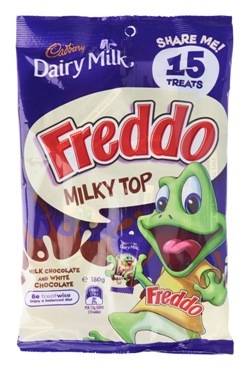 Packet of 15 x 12g Cadbury Freddo Milky Tops. Cadbury Milk Chocolate and White Chocolate. Milk Chocolate contains Cocoa Solids 26%, Milk Solids Minimum 24%. White Chocolate contains Cocoa Solids 23%, Milk Solids 31%.